At age 10, Miss America pageant hopeful Jennifer Smestad was a normal kid growing up in Arizona – until her body and brain began to turn on her. First came the head jerks, followed by involuntary facial gestures. Then came the onset of crippling anxiety and obsessive-compulsive behavior. Finally, Smestad acknowledged something was terribly wrong. Tourette’s is an inherited neuropsychiatric disorder, also associated with attention-deficit disorder / attention-deficit hyperactivity disorder / obsessive-compulsive disorder (ADD/ADHD/OCD), which is believed to be organic damage to the central nervous system. Currently, there is no cure for Tourette’s, no medication is known to work universally. There are also significant adverse effects with using Western medicine. Needless to say, the shocking diagnosis sent Smestad into a panic and desperate for a cure. But, before she made the decision to undergo brain surgery, a family friend referred her to local acupuncturist Jing Liu. With decades of experience, Liu offered a treatment plan that would nip Smestad’s symptoms in the bud. Liu said that when she first saw Smestad she was struggling to focus and keep up her grades, and was the victim of bullies at school. “After I did a Chinese diagnosis and gave her an acupuncture treatment, I explained how acupuncture works and that gave Jenny a lot of courage,” said Liu, who maintains a private practice in Scottsdale, Ariz. – the Eastern Medicine Center. Courage is one thing Smestad needed a lot of. She said she had a crippling fear of needles and had little to no knowledge of how acupuncture worked, but was willing to try it despite being in the dark about the world of Traditional Chinese Medicine. Liu initially treated Smestad with a combination of Chinese herbs: Chai Hu Jia Long Gu Mu Li wan and Jia Wei Xiao Yao Wan. She was giving Smestad treatment up to three times a week and saw results almost immediately. Smestad’s doubts about acupuncture quickly turned into confidence about the future. To keep her fears at bay, Liu kept treating Smestad with the herbal formula: Tian Ma Gou Teng Yin, Chai Hu Jia Long Gu Mu Li, Jia Wei Xiao Yao, Tian Ma, Gou Teng, Long Gu, Mu Li, Bai Shao, Chan Yi and Ju Hua. Dr. Jing Liu of the Eastern Medicine Center with Miss Arizona, Jennifer Smestad. Liu said the acupuncture treatment she used consisted of the Xing Nao Kai Qiao (XNKQ) principle in acupuncture treatment, known as the XNKQ prescription two: Nei Guan (P6), Yin Tang (EX), San Yin Jiao (Sp 6), with modification point Si Shen Chong (EX), and ear points Xin, Shen Men and Liver. Liu noted that in Traditional Chinese Medicine, Tourette’s development is known as an overabundance of yang due to deficiency of yin, causinganimbalance between yin and yang, phlegm, Liver-Wind and Fire. It involves the Heart, Liver, Spleen and Kidney. The treatment is focused on regulating yin and yang, and relieving mental stress. Smestad’s body was quick to react to the herbs and acupuncture. After spending most of her teen years treating her Tourette’s symptoms, Jennifer delved into the world of pageants. Her determination to rise above obstacles has led her to many exciting opportunities. She won the title of Miss Maricopa in 2012, and this year she became Miss Arizona. 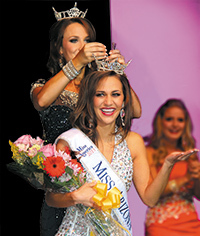 In September, she also competed on the national stage at the Miss America pageant in Atlantic City, N.J., along other hopefuls from around the country. She said she was able to share her belief in acupuncture with other contestants at the pageant. Smestad said that as Miss Arizona, she immediately knew her platform would be awareness for Tourette’s syndrome. She has also incorporated spreading the message of natural cures, such as acupuncture, because of the success she has experienced with it. This year she has been working with the Arizona chapter of the Tourette’s Syndrome Association to spread awareness about the disorder and to let others know they too can find relief through Traditional Chinese Medicine. Smestad said these days, she feels she has already won the biggest competition of her life – gaining back her health – with the help of acupuncture. “I have been able to inspire others to try acupuncture, and that’s what it’s been really all about – inspiring others, giving others hope,” she said.